What Guangdong aims to do in next 5 years? The 12th Guangdong Provincial Party Congress started yesterday on May 22 in Guangzhou, capital of Guangdong. And a work report of the CPC Provincial Committee was delivered to outline the the province’s future plan. 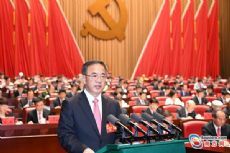 The work report stresses that following Xi Jinping’s instructions to the province, Guangdong will uphold the CPC leadership, adhere to socialism with Chinese characteristics, keep the new development concepts of innovation, coordination, green, opening up and sharing, and stick to reform and opening-up. Xi also urges Guangdong to make major contribution to support the country’s supply-side structural reform, innovation-driven development strategy and a new economy pattern of opening up. And the province will lead the campaigns of building a prosperous society in a comprehensive way as well as constructing socialist modernization. The residences’ income growth will keep pace with the overall economic growth. The economic structure will be further optimized, innovation will become the leading force of economic growth. Modern industrial system and an open economy system will take shape. Democracy system will be optimized, a law-based government will take shape. The judicial system’s credibility will increase and systems in all aspects will be improved. Support will be given to culture development. Chinese Dream and socialist core values will be further spread. The civilization will be improved. People will live a happy and well-off life. The basic public service will cover more people. The society will be more harmonious and stable. Expand the environmental improvement projects to cover all aspects. Achieve greener production mode and life style. CPC Guangdong committee will make new achievements in anti-corruption campaigns and improve the Party management. The Pearl River Delta will plan its development with advanced countries and regions as benchmark so as to become a pilot area of modernization and to drive the province’s development to a higher level. East, West and North Guangdong will speed up their development and ensure the whole province to become a moderately prosperous society in all respects as scheduled.